Based on client meetings we have had around the world and across multiple investment disciplines over the past several weeks, we believe the majority of investors are more concerned with missing the recent strength in stocks relative to potential pitfalls and risks. Performance trends paint the same picture, in our view, as elevated beta, low quality and perceived higher momentum names continue to define US stock market performance. 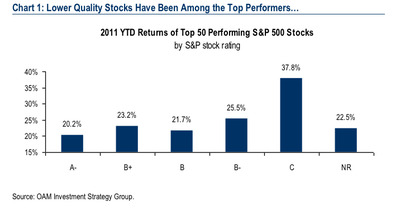 For our part, we believe such investing behaviour is “defensive” given investors’ overarching fear of underperforming. As a result, we remain increasingly comfortable with our market assumptions of single-digit returns in 2011, with the likelihood of a near-term and surprising correction rising, in our view. 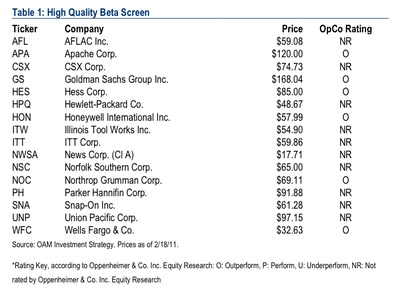 The firm has also put together a few charts showing just how far “low quality” and “high beta” names have outperformed. 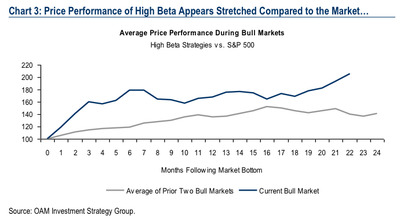 But based on historical recoveries, the current beta rally is stretched. 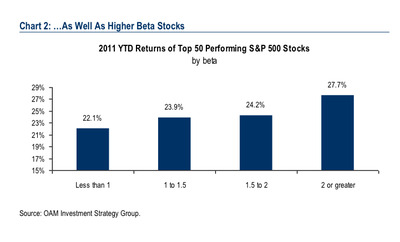 These are the high-beta companies that Oppenheimer likes.